WHO Vote – Will It Save Our Lives? Did a Twitter Post Cost Former Minister Top Position in Global HIV Fund? 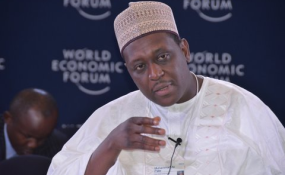 Dr. Muhammad Ali Pate, former Nigerian Minister of State for Health, speaking at the 2014 World Economic Forum Africa in Abuja. It is a great privilege to be invited by the Ondo State University of Medical Sciences (UNIMED) to deliver its 3rd Distinguished Lecture. I would like to extend my appreciation to His Excellency Governor of Ondo State, Vice-Chancellor and entire UNIMED leadership, Ondo State Government and its people for the warm welcome and the gracious opportunity of this lecture. The lecture aims to share a perspective on the future of health and the promise of primary health care in Nigeria. I intend to place Nigeria's health situation within the context of important trends that are occurring globally, as well as in our mother continent, Africa. Within that context, I will attempt to link health and economic development, share some observations on Nigeria's demographic dynamics linked to its health status, aspects from recent history of its health system's evolution, identify the underlying reasons for the key challenges and present a few ideas on the way forward. There are several major transitions happening gradually in our world today, and particularly in Africa and Nigeria, which can easily escape notice. These transitions range from demographic transitions in terms of population structures and ageing, urbanization, political transitions until recently in democratic directions, climatic shifts, economic transitions into the fourth industrial revolution and including technological changes from big mechanical machines, towards miniaturization, mobile, biotechnology, nanotechnology, genomics to proteomics and metabolomics. All these transitions can be interconnected and have potential implications for individual, population and planetary health. More immediately, they may have implications for future of health systems and the ongoing epidemiologic transitions. In May 2012, The Lancet medical journal convened a specific Commission on the future of health in sub-Saharan Africa. The Commission comprising diverse African experts, academics, policy makers and practitioners, decided to take a medium to longer term perspective on the issues, opportunities and challenges facing African health systems. We recognized the region's potential to improve health on its own terms, and largely within its own resources in the long-term. Recognizing the substantial inter-country as well as intra- country variabilities in health systems and outcomes, the commission concluded its work with justified evidence for optimism in Africa's health future. But that optimism is not guaranteed, it will depend on how national and sub-national leaders exercise their role to invest appropriately in people-centered systems with solid primary health care foundations. In this era of the Sustainable Development Goals, and move toward Universal Health Coverage, bold new ideas must be explored and executed upon, thinking ahead, learning from global experiences but pursuing sometimes uniquely African paths, and deliver results for everyone. The Commission's vision and aspiration is that by 2030 Africans should have the same opportunities for long and healthy lives that new technologies, well- functioning health systems, and good governance offer people living everywhere. It laid out a clear agenda for action. I was very honored to join some brilliant minds on health in the African continent and globally to contribute in the commission's work, led by Peter Piot and Nelson Sewankanbo. The Commission's report was officially launched on September 14th in Nairobi, Kenya, but given this gracious invitation by UNIMED I thought to also bring copies of the report as a way of disseminating the results within Nigeria (1). Nigeria has a large and fast-growing, youthful population. By the year 2050, it is likely that its population, based on current growth rates, will be near 400 million, making Nigeria the 3rd or 4th most populous country in the world. There are economic benefits for a nation from having a youthful population when they are gainfully employed. This potential benefit, also called the demographic dividend, results when the share of the working-age population is larger relative to the non-working-age, dependent population. For a country to realize the demographic dividend, it must first undergo a demographic transition (change in the population structure), which means a shift from higher fertility and child mortality to relatively lower fertility and child mortality. During the early stages, mortality rates among children fall because of improvements in sanitation, hygiene, nutrition and reduction in preventable diseases. When child survival improves, parents are likely to feel more confident about reducing desired fertility rates and women become better able to participate in the broader labor force. The critical stage is when the labor force grows more rapidly than the population dependent on it (the dependency ratio starts to fall). This frees up resources for investment in economic development and an opportunity for rapid economic growth, provided the right social and economic policies and investments are in place. The period during which a demographic dividend (economic benefits of a youthful population) may be realized can be up to five decades or more. (2). Later, when the older ones also invest their savings or through pensions, further extension of the dividend occurs. In 2013, shortly after voluntarily resigning from Government and went back to a University, I approached Professor David Bloom at Harvard University to explore Nigeria's demographic dynamics. With data supplied by the National Bureau of Statistics, we modeled the country's population dynamics, based on various explicit assumptions and linked with future economic growth scenarios. There are a few relevant insights worth mentioning at this stage: Nigeria's north-east, north-west and north-central zones have remained with stable population structure in the last 5 decades, with continued high child mortality, higher fertility and dependency ratios. The south-east, south-west and south-south zones are already undergoing demographic transition with ageing becoming prominent particularly in the south-east, potentially raising the dependency ratio in that zone as well. There are real prospects for demographic dividend in Nigeria's future, but those prospects are not guaranteed. Policy makers at Federal and State levels ought to understand various implications and take adapted actions for their contexts (3). These would include reproductive health services as well as educating girls, empowering young women in society. Given diversity of performance across various zones, the implications are more serious for some zones than others. Nigeria's population health is still sub-optimal, despite huge investments by households, public and private sectors over the years. There have been recently observed progress in some areas, such as polio eradication, but as a country, we did not achieve the health-related MDGs by 2015. While our under-five child mortality rate has been reducing at annualized rate of 4.8 percent, it did not reduce fast enough for us to achieve the MDG target of reaching one-third of the 1990 under five mortalities by 2015. Unfortunately, Nigeria still accounts for a disproportionate share of the world's burden of child and maternal morbidity and mortality. According to the most recent National Demographic and Health Survey, maternal mortality rate is 545 per 100,000 live births which is equivalent to 33,000 women each year or about 1 in 9 maternal deaths worldwide, the 2nd highest global total for a country. Infant mortality rate is 75 per 1,000 live births, 8% of the global total – an estimated 70% of these deaths are preventable. In addition to lack of access, failures of health services delivery can contribute directly to maternal mortality even if women have access to services (4). In terms of child mortality rate, it is 157/1,000, which is equivalent to ~1 million deaths per year – or ~10% of the global total. Approximately one million women and children die every year in Nigeria from largely preventable causes. Preventable diseases like malaria, measles, bacterial meningitis, infectious diarrheal diseases, and malnutrition account for most of the childhood deaths. Various infectious diseases outbreaks occur frequently, such as Lassa and even the ongoing Monkey pox virus outbreaks. An unacceptable proportion of Nigerian children under-five are acutely malnourished or stunted. The grey matter infrastructure of the stunted child is much less connected, organized or active compared to well-nourished child. Yet, millions of Nigerian children are stunted. Stunting detracts from cognitive abilities of children and leads to lower productivity as adults, with implications for the economy in the future. In addition, we face growing challenge of non-communicable diseases (NCDs), largely due to ageing population and lifestyle changes. Hypertension, diabetes, cancers, substance abuse, mental illnesses, trauma and new forms of injuries are emerging prominently in the national burden of disease. With increasing urbanization and social dislocation, we may even see further rise in the NCDs. To accelerate our demographic transition towards reaping a dividend, we must quickly reduce child morbidity and mortality, improve women's health, educate our girls and empower our women. Another expected goal of a health system is to protect its population from heightened financial risk due to costs of healthcare. In the case of Nigeria's health system, an estimated two-thirds of our Total Health Expenditure per capita is privately financed, out of which 95% is funded out of pocket. Health insurance coverage is limited largely to the few wealthy or formally employed, who use public or private facilities in the country as well engage in medical tourism abroad. Millions of Nigerians remain exposed to risk of catastrophic health expenditures due to lack of health insurance and weak provision in public facilities. This represents failure in effective and efficient resource mobilization to finance health care. With this situation, the poor in Nigeria easily get poorer because of ill-health, while ill-health itself contributes to even more poverty in a vicious cycle. This exacerbates significant inequities that already exist in access, utilization and health status by rural- urban, as well as socio-economic circumstances. When Nigeria's wealthiest income quintile groups are compared with the poorest income quintile, 2-3-fold difference exists in access to treatment for fevers and diarrheal diseases, 8-fold difference in access to antenatal care and skilled delivery, and almost 13-fold difference in access to routine immunization by age of 24 months. What this means in simple terms is that the burden of morbidity and mortality is skewed heavily towards the lower socio-economic income groups (5). Inadequate attention to the broader determinants and healthier public policies. Nigeria's fiscally decentralized federal system of governance prescribed by the 1999 Constitution has fundamentally meant a fragmented national health system. It is a great challenge to manage the complex system as one given the various contending units. That health is on the concurrent list has meant every level is responsible and no one is fully accountable. The absence of sufficient inter-governmental accountability mechanism means that the Federal Government must pursue its policy objectives largely through projections of soft-power. Here, I must pay tribute to several giants in the Nigerian health policy space over the past several decades: the likes of Late Prof. Olikoye Ransome-Kuti, Prof. Adetokunbo Lucas, Prof. Umar Shehu, Prof. Eyitayo Lambo, Prof. Idris Muhammad, our recently departed Late Prof. Babatunde Osotimehin and many others. It is on the shoulders of these giants that the recent progress in Nigeria's health systems were made. In 2004, during the President Obasanjo Administration, the National Health Policy assigned to Local Governments responsibility for implementation of primary health care, States responsible for Secondary care and support to LGAs, while Federal mainly responsible for regulations, tertiary care and indirectly through NPHCDA and NHIS aspects of primary health care. During the Presidents Yar'adua and Jonathan administrations, the Primary Health Care Under One Roof Policy was established (2010) and the National Health Law (2014) took effect, even if not currently fully implemented. Policies to redistribute health human resources to front-lines, such the internationally recognized Midwives' Service Scheme and Community Health Workers' program were demonstrated to be effective through the MDG DRG mechanisms. According to an independent Impact Evaluation of these programs by the World Bank, within 9 months (May 2012-February 2013), Skilled Birth Attendance increased by hefty 14% in areas where SURE-P MCH Program intervened as compared to controls. Results-based financing was successfully introduced in Ondo, Adamawa and Nasarawa States, and is currently being refined based on learnings and expanded in the North East. The Saving One Million Lives Program launched by President Jonathan in October 2012 is still being implemented and supported by World Bank's $500 million financing with most of it to the States. More than a million lives were saved from preventable deaths through such initiative as confirmed by independent evaluators. In the realm of immunization and public health, several new vaccines were introduced to the routine immunization system between 2009-2013, while detection of wild polio virus transmission has been effectively stopped for more than 3 years in all the Nigerian states except Borno State. The polio infrastructure, such as the Emergency Operations Center played vital role in stopping the Ebola virus in 2014. Here, on the success on polio eradication, I must call out former Presidents of the Federal Republic of Nigeria across Four Successive Administrations for their leadership. President Obasanjo tackled the initial Polio crisis in the north during 2003/2004. President Yar'adua famously declared in 2008 that he "will do whatever is humanly possible to eradicate polio from Nigeria". President Goodluck Jonathan delivered on the promise he made when inaugurating the Presidential Task Force on Polio Eradication in 2011 that, he will not hand-over polio. And, he did not. It is on record that President Muhammadu Buhari, publicly immunized his grandchild and is building on the work of his predecessors to ensure that polio is fully eradicated from Nigeria. I will also like to acknowledge the tremendous role played by Traditional and Religious Leaders in the effort to kick-out polio from Nigeria. In the north where it was most prevalent, Northern Traditional Leaders led by the Sultan of Sokoto and representatives of all 19 northern States actively engaged their communities to foster trust and encourage vaccinations. These past Presidents of Nigeria and Traditional leaders have demonstrated unequivocally, in this manner, that the issues of public health are non-partisan and can be supra-politics. They are Nigeria's national interests. It is my hope that Nigeria's move towards Universal Primary Health Care Coverage will also receive similar policy consistency in the decades that it will take for us to achieve it. These achievements and policy instruments have demonstrated that, despite constraints, there are back-doors for fixing the structural issues within our federal system and for making progress by projecting soft power and a collaborative, multi-stakeholder approach in pursuing health objectives. However, there are still important gaps remaining. For example, lack of coherent, effective national health financing policy is manifest in at least two ways: i) the inefficient resource mobilization for health, whereby 95% of the 63 percent private portion of total health expenditure is household out of pocket expenses, contributing to the significant equity issues that we experience in the health sector; and ii) allocative inefficiency, whereby allocation of health sector budgetary resources tends to favour higher level, infrastructure dominant and curative services. Primary health care services, core public health functions, multi- sector approaches, such as for dealing with malnutrition, still play at second place to more expensive curative care. In other words, the mindset of Panacea still tends to trump that of Hygeia. We only hope that the new National Health Policy will build on these preceding efforts to bring further coherence in health sector governance in Nigeria and improve focus to deliver preventive services using platform of primary health care. While the policy making process has worked reasonably well between the Federal and State Government levels, we can be more inclusive in approach to healthier public policy-making. Other relevant sectors (education, agriculture, transport, environment, trade/industries, private sector, technology) have not been sufficiently engaged in health policy making in Nigeria. From public health policy making we should move towards healthy public policy making, whereby the intersectoral aspects are addressed in our policies right at the outset. In addition, since we have a mixed public-private health system, the private sector can play a very important role in unlocking the health value chain. I recall in 2012 when we hosted the first ever Private Health Sector Summit with the Federal Ministry of Health. A corporate private sector leader reported that it was the first- time private providers sat with the public sector in non-predatory environments to discuss policy issues. The civil society organizations operating in health have become a formidable partner to Governments, but their partnerships can be further systematized. Our health sector regulatory frameworks are robust, even if occasionally burdensome. But the regulations are not effectively enforced particularly at subnational levels. For at least the past 2-3 decades, Nigeria's broad governance environment has also been slowly infected with the virus of corruption, which gradually escalated to level of a social epidemy. Despite well-intended efforts by various administrations over time, and the great progress being made by the current administration, the social epidemic has continued to persist within the wider governance system. Unlike polio virus which we have managed as a country to stop through vaccinations, the virus of corruption is good at adaptability within various systems, and there is no vaccine for it yet. The health sector is therefore not immune to the wider social epidemy in the broader governance environment. Unlike other sectors, however, corruption in health kills and maims. While there is no easy solution, what we need in my view is the addition of a system-approach to the simpler approach of focusing on only "bad apples". The good apples can turn into bad apples where the storage system is not well-functional and controlled. Perceived quality of care that Nigeria's health system offers within both public and private facilities does not meet the expectation of its clients. This is confirmed by many wealthy and high officials choosing medical care abroad, from basic medical checks to complex conditions, some of which are treatable within Nigeria. Until 2012 Nigeria did not develop a National Healthcare Quality Strategy, nor did we focus on building necessary human capabilities necessary to ensure high quality care within the health system. In many areas, there are physical infrastructures that are not in good status, remain inadequately staffed, and without essential commodities for effective service delivery. There are hundreds of distinct medical supply chains for essential life-saving commodities. This fragmentation causes inefficiencies, stock-outs, poor quality of care and risks due to substandard and counterfeit drugs. The new Drug Distribution Guidelines which was initiated during the last administration and being implemented currently is right step in a good direction. We have not focused as much in managing the health workforce for productivity, therefore we expend a lot on specialists that may not have complementary inputs to deliver what their specialty can deliver, or managing petty squabbles derived from inter- professional rivalry. The private sector itself, while large, is heavily fragmented, and weak, compounding its challenges from policies, regulations and lack of desired access to capital. Given the health financing situation, the cost of health care is often unaffordable especially for the poor, hence limiting their health-seeking behavior. Community engagement is largely focused on immunization services. Systematic community participation in health activities that are not donor funded is limited. Even where there is awareness, sometimes the lack of trust in government and the health system undermines peoples' willingness to seek care. For example, only about 38 percent of women have skilled attendance at birth. In some areas, health facilities exist and are staffed, but patients do not utilize them. Instead they attend patent medical vendors and traditional healers, whom they trust more than their local government facilities and programs. Many parents refuse vaccinations because of lack of trust in the formal health system. Lack of trust is compounding the current Monkey pox situation. Health outcomes do not depend solely on health services. For example, only 55% of reduction in maternal mortality is attributable to medical care in some countries. Other determinants such woman's health, nutrition, education, economic circumstances and empowerment, certain cultural practices, transportation infrastructure may contribute to maternal survival in addition to direct medical care. Similarly, factors such as social policies that affect maternal levels of education, nutrition, sanitation and hygiene, certain cultural practices, family income, location may contribute to child survival beyond direct medical intervention. In this regard, a heavily medicalized non-primary health care focused system is only able to improve health outcomes up to a limit. Healthier public policies that consider population health in crafting policies such as for infrastructure, urban development, housing, environment, education and labor will be important to improve health outcomes. It is only a primary health care focused health system that will be well positioned to drive the integration of basic health services delivery with broader multi-sector determinants. Health and Politics : To move forward on our path, there must be an accentuated demand for quality health in the political space. During the last elections, the health sector and its challenges were largely invisible in political discourse among politicians and citizens at all Federal, State and local levels. Even where health is raised, it is in the context of construction projects and contracts, for obvious reasons. The voice of Nigerians for leaders to fix our health system must rapidly come up in the political space as we head to 2019 for politicians to pay serious attention when they get into office. There are political dividends available from good health policies: Obamacare in the US, or Malaysia's Mahathir and the creation of the Malaysian Heart Institute. Health professionals need to improve their policy and political analysis, engagement with the political system, economists, private sector actors, civil society and the media. This cannot be successfully done by external donors, it should be domesticated in our own context. We should also learn how to apply supranational influences from Nigeria's global commitments, such as the SDGs, to put pressure on our leaders and hold them to account. Transparency and accountability : Without data there will be no transparency. Lack of transparency is the perfect excuse for not holding actors accountable. When there is no clear, incontrovertible data, who can be held responsible? We must tap lessons from other sectors to establish realistic metrics that can measure progress in multiple dimensions and make those data widely available to citizens and communities so that they can hold their politicians accountable. We should do a better job at communicating the situation of the health sector and what needs to be done. The focus of this administration on fighting corruption must be continued, using a systems-based approach in addition to removing "bad apples". Revitalize Institutions involved in health governance : This includes the National Council on Health mechanism as well as specific institutions in federal establishment. These should have their capacity improved, not only in terms of quality people but also systems, procedures and mindsets. For example, regulatory agencies at subnational level to be able to enforce the rules in non-predatory manner. The structures of our federal health institutions must be revisited to remove overlapping functions, improve efficiency and create synergy. If we look at large Federal countries like Mexico, US or Ethiopia, they all have far less fragmentation in the institutions that govern their health systems. Several Federal health institutions can be merged along the lines recommended by the Orosanye panel. Combine Sensible Policies and Execution : Nigeria has never lacked, in general, and with few exceptions mentioned above, sensible policies, strategies and plans. However, we have far more clear challenges in their delivery and execution. We tended to focus mostly on the right side of the equation, inputs, such as buildings, equipment, trainings, less on the left side, the important results in terms of health outcomes. Here is a case: when we initiated the Saving One Million lives initiative in 2011, it was essentially an effort to deliver results by focusing on health outcomes first and working backwards to the system inputs. We put in place mechanism for prioritization based on the burden of disease, effort to improve coordination and alignment of various efforts, improve data tracking of implementation performance and provide technical and problem-solving support to the various implementers at federal and sub-national levels. It is indeed gratifying to see now that the approach has largely worked in several states after several years. As the Results-based financing is expanded through donor funded programs, Federal Government and States should consider moving their public spends also in results-based manner. The Basic Health Services Fund, when it becomes reality, should be patterned after the results-based approach that has been successful so far. At this point, the rhetoric of Universal Health Coverage is not easily reconcilable with the level of health finance and situation of NHIS and its coverage numbers. To reconcile the aspiration with our reality, we should develop the appropriate financing policies and legal framework to efficiently mobilize health finance from private hands, in tandem with increasing allocation, even as our economy grows and we get better at collecting taxes. Except for a few states, many subnational units do not allocate the necessary budgetary resources for even the basic services. Even where they allocate the resources, it is inefficiently allocated, released or that the quality of spending is poor. At the Federal level, health budget has declined in real terms in the last couple of years. Our routine immunization financing is on annual hanging-in-the-balance mode perpetually. External donors remain puzzled why an economy like ours is largely dependent on external financing for immunization, HIV/AIDS, TB or Malaria. Nigeria should domestically finance its efforts to end the 3 disease epidemics before the upcoming epidemy of non-communicable disease for which there may not be external finance. The Nigerian Government should be courageous enough to guarantee off-the-top the cost of basic vaccination for all children born in this country regardless of where they are located. We have, for decades, subsidized universal consumption of hydrocarbon fuel, but remain unable to guarantee vaccines for our children. The Federal Government and States should allocate resources enough to show seriousness in the move to Universal Health Care. People-centred health system is primary health care : The idea of people centeredness in health system is not new, as it had been part of the original conception of primary health care at Alma Ata. It involves understanding the dynamic interrelationships of "people, processes, systems, power relations and values in the foundation and the pillars of any effort to improve health and wellbeing". We should develop health infrastructures, organize service delivery considering the perspectives of individuals, families and communities. We should pursue the five inter-dependent strategies recently suggested by WHO in this approach: (1) empowering and engaging people and communities; (2) strengthening governance and accountability; (3) reorienting the model of care; (4) coordinating services within and across sectors; and (5) creating an enabling environment. Community engagement is crucial and linked to improving governance. We should listen better to community voices and restore their trust and confidence in the health sector. We should also undertake deliberate efforts to systematically engage communities, traditional, and religious leaders in health programs that affect them, as was demonstrated successfully in the fight against poliomyelitis. There are millions of volunteers' capacity that can be harnessed towards good health, if we can unleash the latent capacity of our communities. Rotary volunteers across the world have shown how community action can lead to great victories in the case of polio. We should also develop innovative partnership models within the health sector, with other sectors as well as with external non- traditional groups. We should promote Integrated approaches to prevention and care. More than ever before, we should maximize opportunities to integrate service delivery. Primary health care is the best platform for integrated service delivery. HIV/AIDS, TB, Malaria, RMNCH or NCDs can be addressed, prevented at primary level, with effective referral to higher level services as needed. We should invest in ways that show we have zero tolerance for death from the 3 diseases, zero-tolerance for PTCT of HIV, and zero tolerance for deaths due to maternal causes. All women should have the right to exercise reproductive choice. We should aggressively pursue an end to childhood undernutrition (stunting) through multi-sector approach. The brains of our future doctors, nurses, scientists, politicians depend on nutrition today. In terms of integrated approach to supply chain for medical commodities, my view is that only a market-driven solution will work in Nigerian context as it is currently being developed. Public sector should regulate not implement, otherwise we will multiply current inefficiencies. Through Medicare Health Systems in Nigeria, in collaboration with key public and private sector partners, we are now developing a platform that will shortly come to market for integrating supply chain management. We should not relegate the training of multi-functional health workforce particularly at the frontlines while focusing limited attention to best quality specialist training at selected higher- level facilities. The era of industrial disharmony should be put behind us, instead, team-based training and approaches in the workforce should become the norms. The future of health in Nigeria does not belong to only one health profession. It is all of us – doctors, nurses, pharmacists, lab scientists, community health workers, health economists, health managers, health informatics, citizens – that will make it happen. We should move beyond petty rivalry. Strengthen core public health functions : We should reorient our paradigm towards prevention. The followers of Hygeia should coexist with that of Panacea. With changing epidemiology, ageing and rise of non-communicable diseases, prevention is the best way to slow the burden of disease from overwhelming the health system as currently designed. Public health investment is national security investment as we saw with Ebola in 2013/2014. Strengthening disease surveillance and response capacity through the NCDC would be wise investment in everyone's interest. The unfolding Monkey virus outbreak and how it is managed will be a great test. Implementing stringently the regulations of the Tobacco Law is pivotal, so also is reviewing our archaic Mental Health regulatory framework and capacities. These efforts to boost public health must be firmly anchored on primary health care part of the health system. We must also pay attention to environment, climate change and resurgence of infectious diseases in some areas: rains, flooding and cholera; deforestation and Lassa; other vector borne diseases due to mosquitoes. Finally, reaching to global network of Nigerians in diaspora for research collaborations in public health will bode well for our health system in the years ahead. Government must invest its money in research even while looking for external partners for scientists in our Universities. Role of the Private Sector and Medical tourism : I recall vividly in 2011 when then Minister of Finance was asked to defend why the health sector was included in the National Economic Team. At that time, we realized that health is viewed primarily as a consumption sector, rather than a right as well as investment. In large economies, health comprises a major component of national GDP. In United States, the health sector is second only to the Defense sector. It accounted for 1 out of 9-10 new jobs being created. Clearly, there is health sector value chain, in both social as well direct economic dimensions, through better quality workforce, more economic productivity, as well as multiplier effects through service provision, manufacturing, logistics etc. While we like to think that public sector is dominant in Nigeria's health sector, the reality is that we have a mixed system with more services being delivered by the private sector. Both public and private sector have room for improvement in efficiency, effectiveness and quality of delivery. In recent years, we have seen the global phenomenon of medical tourism. With globalization and ease of movement of people across national boundaries, specialized tourism has increased, such as conference tourism, education tourism, food tourism, medical tourism etc. Medical tourism is not only a Nigerian phenomenon, even people from advanced countries such as US, UK, Australia, Europe, travel to lesser developed countries for medical care. Usual destinations are Middle East, India, and East Asia. Nigerians are not left behind. However, what is not often said is that almost all those who travel abroad for medical care, attend private hospitals not public hospitals in those countries. They also pay exorbitant amounts, which if we had developed a wide enough risk pool, individual burdens would have diminished and steady revenue stream developed to encourage the private health sector and keep our foreign exchange in reserves. Federal and State Governments must categorically enforce the ban publicly financed medical tourism. To unlock the potential of the private health sector, I will encourage the Federal and State Governments to collaborate with the Private Sector Health Alliance of Nigeria in addressing policy, regulatory and access to capital constraints that had shackled private sector health delivery in Nigeria. Doing so will develop the sector, including manufacturing and services, create jobs at home and reduce foreign exchange losses from reverse import of health services. Knowledge, Learning and Innovation : We should invest in health human capital. Universities such as this demonstrate the power of knowledge and its importance. Nigeria has in the past produced through training, excellence in various health fields (medicine, pharmacy, laboratory science, nursing, midwifery, basic sciences) that is the envy of other countries. Our Government must prioritize investment in training within our health institutions of higher learning. Beyond clinical experts with technical depth, we should develop curricula and train for expertise in broader health management, clinical governance, quality of care and exercise of leadership, as is currently being done by the Healthcare Leadership Academy in collaboration with Lagos Business School, Duke University, Cambridge University, Epi Afric and other partners. We can tap a youthful generation of IT experts and other non- traditional sectors to find innovative solutions to hitherto difficult problems. Again, here the PHN's Nigeria Health Innovation Marketplace is a starting place for government to partner. I have attempted to link health and national development, situate Nigeria's population health in the context of major trends and dynamics, sketch hypotheses on the underlying reasons for the current health status of Nigerians and identify potential action steps for the future. The future of Nigeria and its population's health is bright. But, that future cannot be taken for granted. Bold, visionary leadership is required to realize that future, through the path of universal access to quality, effective, efficient primary health care services, as foundation for a people-centered health care system. Ensuring public health is core to our national survival. Once again, thanks very much for the invitation and listening. 2. Bloom, D., D. Canning and P. Malaney (2000), "Population dynamics and economic growth in Asia", Population and Development Review, 26, pp. 257-290. Muhammad Ali Pate, CEO of the Big Win Foundation and former Minister of State for Health in Nigeria, has served as adjunct professor of Global Health at Duke University and Senior Leadership Fellow at Harvard T.H. Chan School of Public Health. In 2015, he co-chaired Independent Panel on the Global Response to Ebola, a joint initiative of the Harvard Global Health Institute and the London School of Hygiene and Tropical Medicine. He holds the traditional title of Chigarin Misau and Dan'iyan Ibbi.